Jazz Singer Judy Chamberlain Dallas. Los Angeles. A fascinating journey through a century of song…..
Judy Chamberlain is an eloquent interpreter of The Great American Songbook, music often first heard on Broadway and in the movies during the Golden Age of American popular music. She also loves early rock ‘n roll, mid-century pop, the Beatles and saloon songs. A native New Yorker who started singing professionally at the age of 13, Judy doesn’t use set lists, preferring to stay in the moment. Her repertoire includes the music of Cole Porter, George Gershwin, Irving Berlin, Jerome Kern, Kurt Weill, Rogers & Hart, Rogers & Hammerstein, Johnny Mercer, Harry Warren, Harold Arlen, Harold Rome, Dietz & Schwartz, Alec Wilder, Sammy Cahn, Jules Stein, Gordon Jenkins, Cy Coleman, Michel Legrand, Alan & Marilyn Bergman, Duke Ellington, Papa John Phillips, Paul Anka, Joni Mitchell, Judy Collins, The Mamas and the Papas, The Eagles, Glen Canpbell, John Denver, The Beatles and many other Twentieth Century composers. 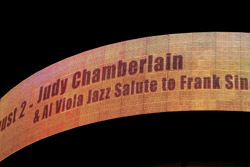 During a three-decade career in Los Angeles, Chamberlain worked with, performed for and collaborated with some of the musical icons who wrote, arranged and/or recorded the definitive versions of the songs she sings. 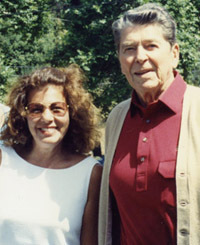 She also wrote restaurant reviews, op-ed pieces and society columns for several daily newspapers and numerous magazines, was regularly heard and seen on FM radio and a regional TV news network and was the off-site concert producer for a well-known Los Angeles jazz station. In 2011, Chamberlain relocated to Texas, where she performs in a variety of settings with top Dallas and touring musicians. “Look at all these people, having the time of their lives,” Viola said to Judy one night from their perch on the bandstand. 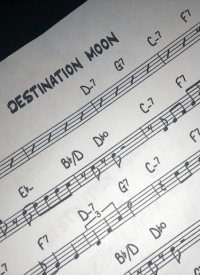 This is a rubato (purposely out of tempo) duet with the great guitarist Al Viola, who is on pretty much everything Frank Sinatra recorded for more than 25 years. I am asked this again and again. The topic of jazz is especially confusing to anyone who takes Ken Burns seriously. A Dallas jazz singer in California: What a swell party it was! Lou Delmonico, one of the original founders of Southern California’s Orange County Performing Arts Center, celebrated his seventy-fifth birthday recently. Lou sits on many arts-related boards; his love of opera and chorale music is legendary. It’s been more than six years since we moved halfway across the country to our home in Dallas, TX. In the thirty years we lived in California, a lot of things changed there — some for the better, and some not. Copyright © 2019 JazzBaby Records. All rights reserved. Design by Zoinks! Graphics.